The Windows 8 and Windows 8.1 photo tile shows 5 random photo’s from your 50 most recent photo’s either on your hard drive or onedrive, but what if there happen to be photo’s in there which you rather not see anymore, or are just too embarrassing to have show up during a coöperate presentation? Then this tutorial is something you should read, we will walk through all the steps you need to take, to make sure the pictures are gone. Photo’s removed from your system will still appear on the photo app tile, these steps will also solve that problem. Close the Photo App and open your desktop. Now that we have done all that, we can go ahead to removing the content from the Tile Folder, this folder has 5 images, the 5 images you see in the tile. Then remove all files beginning with the name Tile and with the .jpg extension. You can now close file explorer. 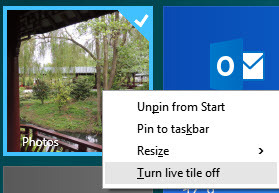 Open Start, right-click the Photo tile, then select Turn on live tile. I hope you were able to solve your problem this way.